9; next year will be our 10 year anniversary! How did you get your start and what is your inspiration? 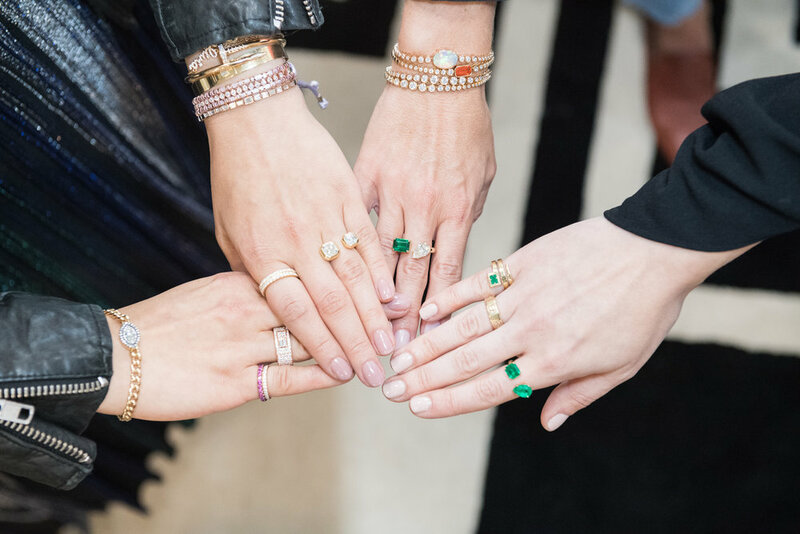 Jenny: We both started hand-making jewelry as a hobby in college and ended up at the same company after school; that’s where we met. Our initial inspiration was to create jewelry that embodied both of our styles and that we would both want to wear everyday. I have a more relaxed and feminine style and Stephanie has a more tailored and polished look. We try to combine both aesthetics in every piece we design. Stephanie: Living in NYC, we are exposed to women from all walks of life and from all over the world. We see so many different styles and trends every day right outside of our office door on 5th avenue. I think we are very good at watching these women and finding inspiration we love in their personal styles and translating this into pieces that feel fresh and new, but without feeling trendy. Because each piece needs to pass through both lenses, relaxed and feminine and tailored and polished, the end result is a collection with pieces for everyone. Stephanie: We love creating styles that are reminiscent of tried and true classics and putting our own fresh twist on them. Our favorite pieces and best sellers of the moment are our Diamond Slider Bracelets. They are a twist on the classic diamond tennis line bracelet that has been popular for decades. We feel that as long as the collection always contains these modern takes on the "classics," we will continue to remain relevant. Jenny: Jewelry is such a personal purchase. When someone comes to us for a piece, it usually marks a special day, time, or occasion in a person's life. We make that experience feel very personalized, intimate and exciting! Stephanie: I love creating things; and seeing a finished piece after it was just a sketch is such an exciting feeling. Then when a client loves it just as much as you do and purchases it for herself, it is icing on the cake! Jenny: I have been creating things since I was a little girl, so I feel very fortunate that I get to have this amazing creative outlet as my career. My favorite aspect is being part of the day-to-day hard work that goes into running our business. Seeing how far we have come through hard work and perseverance is an extremely humbling and gratifying feeling. Stephanie: One of my new favorite secret spots is the Aire Ancient Baths downtown. Being in a super dark room with candles everywhere and floating in a salt pool like the Dead Sea completely relaxes me and makes me feel like I’ve completely escaped the city. It’s a great getaway when you only have a few hours! What is the most memorable feedback a client has ever given you? Stephanie: Years ago, when we first started our line, we met with a pretty well-known NYC "personality." She said, "Where are your peace signs, where are your evil eyes?" We thought it was funny and ultimately decided not to listen to her suggestions. It reminded us that it’s so important to stay true to who we are and not let all the outside noise get to us. Jenny: Most of our mama clients buy pieces to mark special moments in their life, whether it’s the birth of a child, an anniversary, or a birthday. We love that we are creating pieces for them to mark these occasions. They can love and cherish their pieces and eventually pass them down to their children; they’re modern heirlooms. Stephanie: We also bring a little indulgence into their lives. As mamas, we are so busy and tend to forget about ourselves, so we love that we can help other mamas feel good! Marina Moscone, an incredibly talented clothing designer. We would wear every single thing! 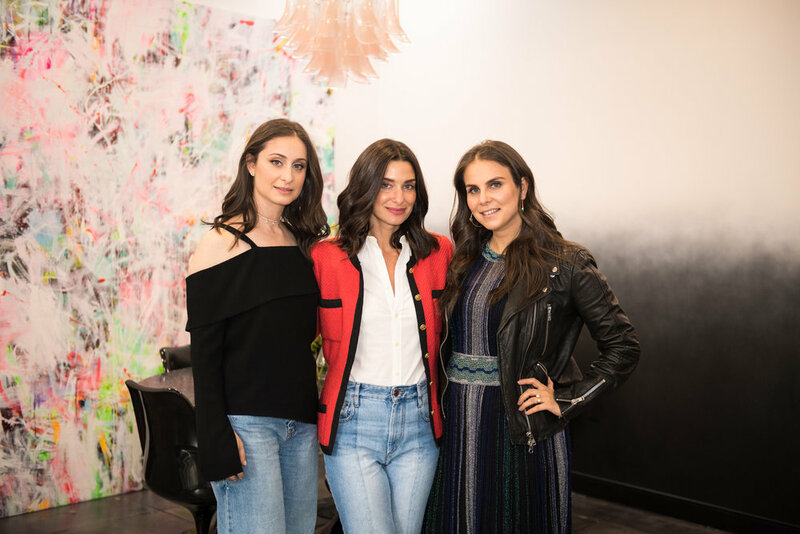 Stefania Allen and Kate Davidson Hudson of Editorialist, they’re a constant source of inspiration for us as moms on the go and running a business. Jill Kargman, because she’s just brilliant. What is the best advice anyone has ever given you/ or what is your mantra "words to live by"
Jenny: So many come to mind but probably, “You got this!” There are many challenges, highs and lows in this business, as well as at home in my personal life, it would be easy to get overwhelmed and stressed. Whenever I start feeling that way, I remind myself that I’m going to get through it and can handle whatever comes my way. Stephanie: My mantra is one day/one task at a time. Tomorrow is a new day. The best advice would be to do what you love. Try not to do everything yourself and stick to your strengths. As moms the day can escape us, what is your best time saving trick? Stephanie: Order everything online, book everything on an app, have all your beauty services come to you! All easy to do in NYC! Jenny: Agreed! Order everything possible online and have everything delivered! Also, with 3 little kids I try to prepare as much as I can the night before for the day ahead. That way I am not wasting time or stressing the next day about getting everything done.